Recognized as the premier event and annual homecoming for the industry, ACT Expo brings together the only “all-in-one” venue showcasing the largest gathering of leading solutions providers in alternative fuels and clean transportation today. Save the dates for ACT Expo 2019, taking place April 23-26 at the Long Beach Convention Center in Southern California. Mark your calendar for ACT Expo next year, taking place May 11-14, 2020, at the Long Beach Convention Center in Long Beach, California. Space assignment, invoice and housing information emailed. Enhanced listing/promotional opportunities are available online via e-booth profile. Sponsor and exhibitor invoice balance due. Deadline to secure placement on our press conference schedule for debuts and major announcements. Paid registrations who have a cancellation request by March 1 will receive a refund, less a $100 processing fee ($25 for Expo Hall Only passes). After this date refunds will not be processed. ACT News Live advertising space reservation deadline. Freeman’s advance warehouse begins accepting crated, boxed, or skidded materials. Hyatt Regency Long Beach & Hilton Long Beach room blocks close. Last day for Alliant Event Services audio visual & computer rental advance order discounted rate. Cvent lead capture pricing increases. The Westin Long Beach room block closes. Renaissance Long Beach Hotel room block closes. Last day for Freeman advance order discounted rate. 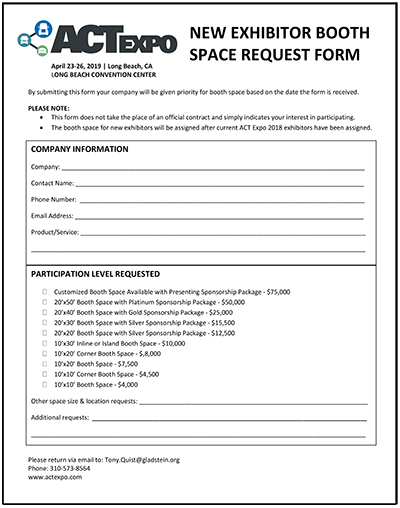 Exhibitor Appointed Contractor Form is due. Order your booth internet and/or telephone service by April 7 to receive a discounted rate. Certificate of Insurance deadline: Please send to [email protected]. Last day to order booth catering before Late Order Fee is added. ACT News Live advertising artwork submission deadline. Materials arriving after April 15 will be received at the warehouse with an additional after-deadline charge. Show-site shipments will be received by Freeman beginning Tuesday, April 23, at 8:00 a.m. until 5:00 p.m. Shipments received before this date will be refused by the facility. If you are looking to build brand awareness for your alternative fuel or clean vehicle technology product/service, this is the place to do it. In addition to attracting thousands of key stakeholders from across all alternative fuel sectors, ACT Expo earns print and online media placements in some of the nation’s most influential media outlets and trade publications. Now that you’ve signed up as a sponsor or exhibitor, make sure you maximize your opportunity for exposure! We’ve outlined a few helpful ideas for your team to maximize your investment, gain meaningful leads, garner positive media coverage, drive website traffic, increase your social media footprint, and ultimately increase sales. The ACT News Live Onsite Magazine can help you maximize your company’s exposure at ACT Expo. Two issues will highlight event news, including product debuts, corporate announcements, and executive interviews. The onsite magazine will be distributed to ACT Expo attendees on Wednesday, April 24 and Thursday, April 25. Click the image to the right to download the ACT News rate sheet ▸. Launching a new product this year? Unveil it at ACT Expo! The expo hall floor provides the perfect venue for customers to see your product firsthand and ask questions. Add excitement by organizing an official “unveiling” at the event, drawing a crowd to your booth by announcing the date and time to customers in advance and onsite. Consider tying the debut to a related giveaway or contest to add double the exposure and buzz! Don’t just tell customers why your product is great… show them! Display your product in your booth and invite customers to see your technology up close. We encourage you to have technical team members at the show to answer detailed questions and explain the unique features that set your product apart from the competition. Consider scheduling specific demo times and inviting attendees to stop by—you can share the times on posters or handouts. Share your news with thousands at ACT Expo! Is your company entering into a new business partnership? Launching a new research and development initiative? An advanced technology vehicle deployment or infrastructure project? ACT Expo is a great avenue to share your news. Key stakeholders from throughout the supply chain will be in attendance, along with media outlets, government agencies, technology peers, and others. If a company executive is speaking on a panel, consider announcing this news as part of his/her presentation. Alternatively, you could schedule a press conference in your booth and invite reporters and customers to attend. Attend the largest clean fleet event representing all weight classes and alternative fuel types and visit our booth (#___) to see (insert product). Add a banner advertisement to your website and e-newsletter. Request a custom ACT Expo 2019 banner with your logo by contacting Audrie Bieganowski at [email protected]. Promote your exhibit in your company newsletter and/or blog. With all weight classes and alternative fuel types represented—electric, hybrid, hydrogen, natural gas, propane autogas, and renewable fuels—ACT Expo is a one-stop shop for fleets to learn how to reduce costs and emissions.